Night driving can make some people a little anxious. 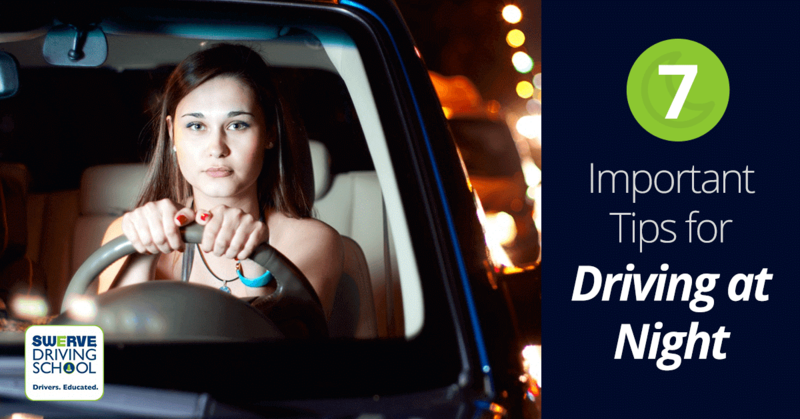 Things can become a little stressful when the sun goes down, and drivers have to deal with decreased visibility, glaring headlights, and a restricted peripheral vision. The darkness makes it harder to see other people or animals on the side of the road, and some drivers have trouble judging the distance between them and other obstacles. There are some simple things you can do to increase your safety while on the road after dark. Take a look at these seven tips and start building your night driving skills today. Don’t stare at the oncoming lights. When it gets late, and you’ve been driving for a while, fatigue may start to set in, and you might catch yourself “caught in the headlights,” as it were. The bright, oncoming headlights of other vehicles can become quite the distraction. More than that, when your eyes have gotten accustomed to the dimness inside your car, the sudden bright lights can ruin your night vision. Instead of fixating on the lights, try to focus is on the right side of the road near the white lines. This will keep the glare out of your eyes and make sure you know where the road is leading. And, if you’ve got someone’s glaring headlights in your rearview mirror, don’t stare into the mirror trying to figure out if they’ve got their high beams on or if it’s just a really big truck. You can adjust the rearview mirror to reflect the light backward and alert them to your discomfort. Use the day/night switch on the mirror and focus on the road ahead. Don’t focus one a single point ahead of you to the exclusion of everything else. Keep your eyes moving and watching for signs of potential hazards. For example, if you’re driving on country roads in the dark, large and small critters can suddenly appear in your way. It’s hard to see them when they’re just standing still on the side of the road, but you can learn to watch for the signs. In this case, you may be able to spot two points of bright lights – the reflection of your headlights in their eyes. When you see these types of hazard indicators, slow down and give yourself plenty of time to react. If your dashboard lights are too bright, they could reflect off your windshield and hinder your night vision. Dim the lights on the dashboard displays, on any GPS system that might be running, and any other light sources that could cause an unwanted glare. It should go without saying (but we’re going to keep saying it anyway) that your cell phone should be set where any lights from its display won’t cause a distraction. The sudden illumination from a ringing phone can light up the entire interior of your car and disrupt your vision. Distracted driving is bad enough during the day, don’t let it happen at night. During daylight hours, statistics suggest that 660,000 drivers are handling cell phones or other electronic devices while they drive. You are three times more likely to get into an accident when using a mobile device in the vehicle. Add to that the other challenges of night driving, and suddenly distracted driving is even more dangerous. So put the phone away until you get home. A smear on your windshield can cause serious visibility problems. Unfortunately, you can’t always see them during the daylight hours, and they only become visible under the direct lights of an oncoming vehicle. Keep your windows clean, both inside and out. You should also keep your headlights clean, your windshield fluid full, and have a microfiber or cotton cloth in the car at all times. This way, you can easily wipe off any fingerprints or smudges on the inside of the windows. Finally, your regular vehicle maintenance should include making sure all the lights work correctly and that they’re aimed properly. Deal with fatigue, don’t fight it or try to ignore it. A National Highway Traffic Safety Administration study suggested that 100,000 police reported collisions were a direct result of driver fatigue every year. This leads to more than 70,000 injuries and over 1,500 deaths out on the road. Other studies have shown that fatigue-related collisions are most common in younger drivers, and that most of these happen at night, generally between midnight and 4 am. The answer is to spot the signs of fatigue and to deal with them. Find a safe place to pull over for a while. Don’t try to convince yourself that louder music, colder AC, or the coffee you had an hour ago will keep you awake. Defensive driving is proactive driving. It means you’re always watching for potential hazards and you always know how you’ll react in certain situations. This is extremely important when you’re driving at night. Always leave plenty of room between you and the car ahead, because they may see something and react in unexpected ways. You have to react just as quickly, and you have to react correctly. It’s also important to remember that your low beams can only illuminate so much of the road, and even high beams won’t give you much time to reach if you’re going too fast. Examine your surroundings, consider the potential hazards, and modify your driving to match the situation. Driving at night may pose a few extra challenges, but if you adopt some of these techniques and tips, you can make the journey much safer. Is Commentary Driving an Effective Driving Technique?